4/11/16: Hey, we're used to hiatuses, right? 2/14/16: Welcome to our new site! Hey, we're used to Hiatuses, right? If you haven't seen the Gravity Falls finale and don't want spoilers, don't read ahead. Well, we knew it was a risk when we started. Obviously the events of Monday's finale have already contradicted our written story. 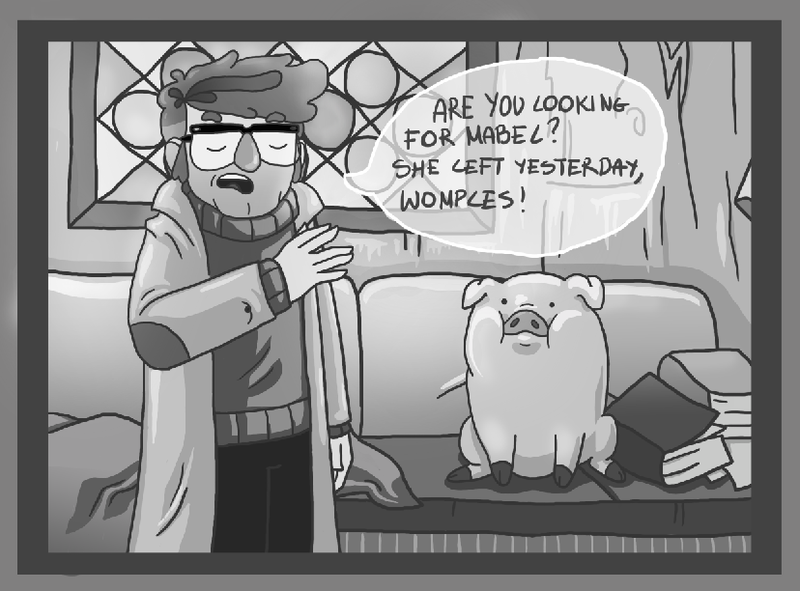 We assumed that Waddles (and Ford, for that matter) would be staying in the Mystery Shack, and that has turned out not to be the case. We also had a couple of other assumptions that turned out to be false, but thankfully, it only took one rewriting session to get everything back on track and make sure our overarcing plot for Falling Forward is canon-compatible. Our short term plans, however, do need to be rearranged. We've decided to pull What Are We Waiting For out of our expanded universe and make it its own short story, with alternate timeline. The story has a special place in our heart - indeed, it's the story that brought our writing and artistic teams together - and we still want to see it in a completed form. We were already in the middle of Page 3, so we're going to finish and post it first. Then we'll put that project aside as an "extra", something for us to work on when we one of our main comic's pages takes an unexpectedly short amount of time, and shift gears towards creating Falling Forward with the new revised outline that we created yesterday. What does this mean for you? Well, it means that if you're here exclusively for Falling Forward, it's going to take a little longer to get off the ground. We're hoping to have splash page art up by the end of the month with maybe the first page of story by mid-March, after which we'll commence the schedule we talked about in the previous news article below. In the meantime, of course, we encourage you to enjoy Disgrace to its Name or converse in our forums. And hey, for the record, even though the finale as written messed with our plans, we all loved it. :) There were, as Alex Hirsch warned us would happen, a lot of things that were left unresolved, or that we wanted to see fleshed out or resolved better (that's sort of why we're doing the comic), but it was still a spectacular end to a wonderful series that will endure throughout the ages. It is our most sincere hope that our humble contribution will keep the magic alive and introduce it to newcomers as the years go by. Welcome to Deadly Puppy Entertainment, a site devoted to various webcomics, stories, games, and other amusing distractions. We're pleased to have you with us, and hope you enjoy reading our material and feel compelled to comment in our forums. We're launching our site initially with two webcomics: Falling Forward, which is an unauthorized continuation of Disney's hit TV series Gravity Falls, and Disgrace to its Name, which is an original webcomic about a substandard being trying to achieve mediocrity in a world with harsh judgements. Falling Forward is a labor of love, drawn by a very talented artistic team with a passion for all things Gravity Falls. Like all new webcomics, it will take a few pages for the basic story to reveal itself, and those pages will take time to produce: currently, we're aiming for a new page every twelve days (it's currently taking our team about nine days from start to finish, and we want to create a buffer to ensure our updates are regular), although it's our hope to eventually become a weekly comic. It picks up right where the story of Gravity Falls left off, with Dipper and Mabel returning to their hometown of Piedmont, California while those they left behind in Oregon adjust to their absence. Storylines set in both Piedmont and Gravity Falls will be present in the series. Disgrace to its Name, conversely, is a labor of stupidity, an experiment to see whether any entertainment can be gained from the very worst artist in the world trying to throw crappy art together and make a story work for it. The art will be wildly inconsistent, the plot will only have loose continuity, and to be blunt, it may very well be enjoyable only for how much it can be mocked and ridiculed. It will, however, come out a lot more frequently, with new pages every three days at the most, because story aside, it's going to be thrown together in ten minutes and slapped up with all the speed and sloppiness of presidential campaign signs in New Hampshire. :) If nothing else, it will allow you to appreciate the extra time spent to make Falling Forward look halfway decent. It is our hope that this website becomes more than its initial offerings, and you, as a member of our new community, will have a lot to say about that. We've got some ideas for other things to add, but we're also open to adding some of your things as well. Always wanted a webcomic, but had nowhere to put it? We'll gladly host it for you. (It can't look any worse than Disgrace to its Name. And I don't mean that as a requirement for posting, I mean I challenge you to make something worse, I don't think it's possible.) Interested in telling a story here? The only thing we ask is that it be either humorous, or have some kind of connection to popular culture, since those are the things we focus on for this site. 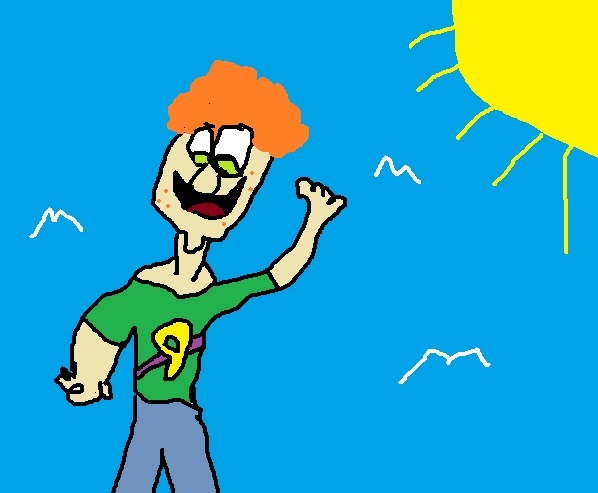 Want to write reviews for the latest games or movies, or post a 4chan-style flash animation (of your own creation) that you think deserves a more permanent place on the internet? You can do all of this for free, as long as you understand that one of these days (not this year, we're nowhere near ready for it yet, but maybe in 2017) we may try to make some money off of it, either in the form of ad revenue (which we'll be keeping all of) or merchandising (which we'll share with you, 60% to you and 40% to us). As long as you're cool with that, just hit us up on the forums if you want to add some content.